Single Sign-On - KAZ - Certified partners with ClassLink and RMUnify . "I'm continually receiving thanks from Open University students who had felt 'stuck in the molasses' when working at their computers, and now can concentrate on their work rather than the keyboard." In today’s world of computers and technology and with an ever increasing percentage of course work and assignments having to be presented in typed form, the need to equip students with the ‘life skill’ of touch typing in order to prepare them for the working environment has never been more essential. KAZ’s new inclusive typing tutor for Further and Higher education caters for all students, including those with SEN/Dyslexia. The program opens with an optional 'Preference Screen' - which tailor makes the course - teaching typing skills whilst minimising disturbances related by visual stress. ACCELERATED LEARNING is the most advanced teaching and learning method in use today. It is a 'total system' for speeding up and enhancing the learning process. Based on the latest brain research, it has been proven time and again to increase learning effectiveness. 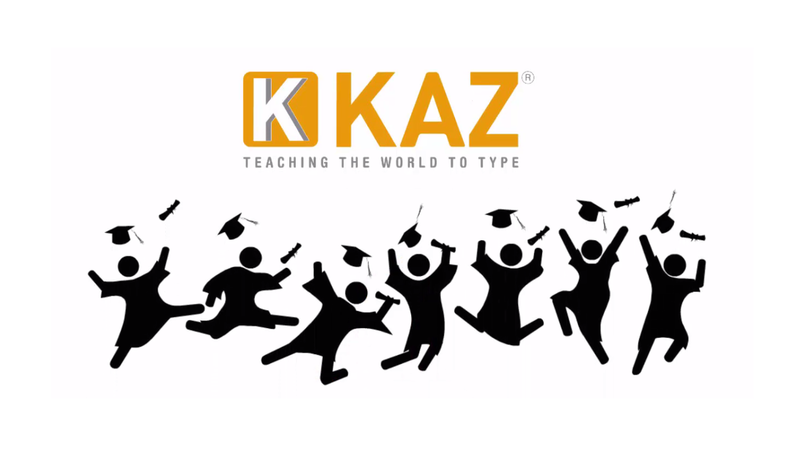 KAZ is a professional ACCELERATED LEARNING typing tutor, especially designed for schools and further education. It was scientifically developed by the same course team of experts responsible for producing over 55 RSA/NVQ level computer skills courses. The revolutionary method has dramatically reduced the time and eliminated the boredom associated with learning to type. It offers students from 6 years upwards an enjoyable method of learning easily, efficiently and effortlessly - whilst teaching them to type quickly, accurately and with rhythm and good posture. The KAZ program opens with a unique © Preference Screen - catering for all students. The screen is set to ‘default’ - a setting suitable for the majority of users. However, those with SEN/Dyslexia or suffering from visual stress should change the preferences until they can read the sample text comfortably. Once selected, these preferences will be applied throughout the course. Unlike other typing tutors based on repetitive exercises and distracting and time consuming games, KAZ's unique, patented and revolutionary ACCELERATED LEARNING method uses 'brain balance' - i.e. it engages the major senses of sight, sound and touch simultaneously, radically enhancing memory retention and recall - which is why it is so effective. Using specific combinations and progressions of just 11 words in 5 easily memorised, scientifically structured and trademarked phrases, the revolutionary method trains the fingers on both hands to work symmetrically and simultaneously, whilst teaching students the position of the A-Z keys. No other typing tutor works in this way. The program solely focuses on teaching typing. It does not try to teach typing along with other subjects such as English, as this just splits concentration and interferes with core learning. Learning to type correctly requires full concentration but needs to be presented with a lighthearted approach, so that learning is enjoyable. KAZ successfully manages to combine the two by cleverly entwining its focused teaching technique with amusing animation. Typically, the programme takes just 90 minutes to teach the A-Z keys and approximately 4 hours to cover the whole keyboard. All of which can be taught in short modules to fit in and around busy curriculum timetables - making KAZ the ideal choice for any school, especially where time is limited and fast results are needed. The program has a simple, fresh and uncluttered presentation style, an easy to read typeface, high foreground and background colour contrast and provision of speaking key's option covering the A-Z keys. Once the first phrase is completed, a real sense of achievement is gained, motivating the student to continue onto the next phrase and so on. Each section offers encouragement and instruction in short lessons in order to hold interest and concentration. The student is allowed to progress at their own pace, acquiring the skill and gaining speed and accuracy without even realising it. Touch typing removes a barrier to creative writing, as the need to keep alternating between screen and keyboard is eliminated and the students effectively 'think type' words straight onto the screen without being aware of what their fingers are doing. They are in the 'flow' of full creative writing at speed. This new edition is the same as our Further/Higher Education edition but with an additional assessment module incorporating a Multiple Choice Paper and Typing Test. Incentivise your students to complete our new City & Guilds Assured course, where on successfully completing the 6th and final module, they will receive a digital certificate and badge from a world recognised brand to showcase on their Social Media Profiles, CVs and job application forms. Equip them with a portable 'life skill’ and an extra tool to help them gain employment. With motivational materials and a comprehensive Teacher's Administrator Pack (enabling monitoring of student progress, i.e. speed, accuracy and lessons completed), the ability to import the school database and group users in minutes, sample lesson plans and Teacher's Guide - it's never been easier for teachers to administer, monitor and teach students how to type. 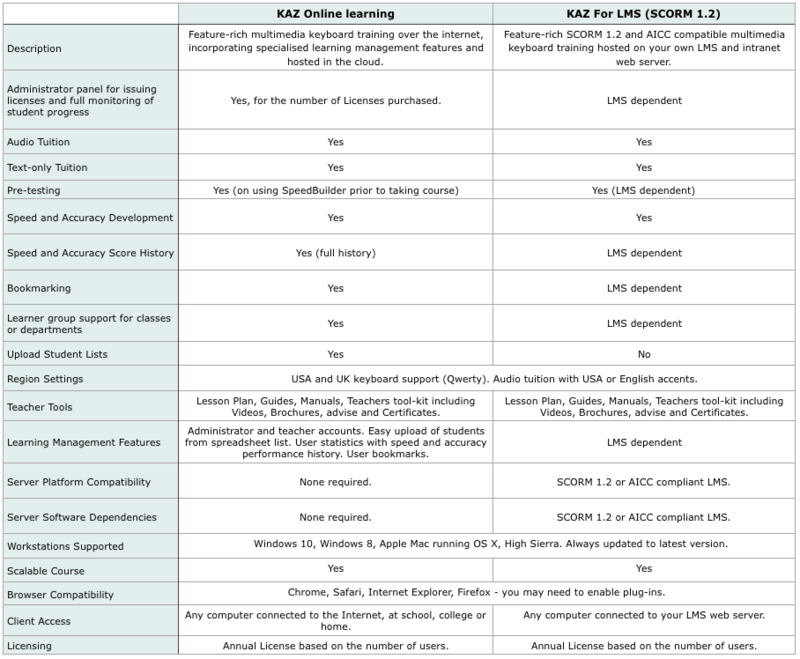 Our software is available Online via our cloud based server, as a download for installation, for intranet use, in SCORM 1.2 compliant form for use in LMS/VLE systems, in Single Sign On (SAML) mode for cloud based LMS and RM Unify. NO other typing tutor is deliverable across such a wide range of IT platforms. With in-excess of one million users, KAZ was selected by the prestigious Open University and widely used by thousands of primary and secondary schools and in further education worldwide. Don't take our word for it, try it yourself for free and with NO obligation.We can set you up with an Online trial in minutes. Give your students a head start and teach them to type. Our ‘Affiliate Scheme’ is proving popular where there is little or no time to schedule or integrate KAZ. Suitable for establishments who would like their students to equip themselves with this skill at college or Uni, whilst generating funds. This scheme is simple and straightforward. We provide all the links for you to simply integrate into emails and/or your website. Contact us for further details. All our Education Online licenses now include a choice between the ‘Standard’ and the new 'SEN / Dyslexia edition’. The following feedback is from teachers in schools who have purchased or used KAZ and who have written to us. Their comments are unsolicited and we have their written permission to quote them'. "I am seeing some excellent accuracy and speed results. 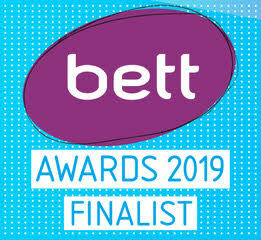 KAZ is user friendly and it is really good that I don't have to keep monitoring students escaping to play the keyboard games that most other typing programmes have attached to them." "The students do enjoy using KAZ some even use their lunchtime break to come in and practice!! and the fact that it can be accessed at home too is a big plus. As you know, we've just re-licensed for another year, which pretty much speaks for itself. The Staff Training session went very well. We did it over 2 days with a 2-week interval between the days. We also presented a small prize and trophy to the best achiever to make it more fun and encourage a bit of competition!" "The combination of my expertise and ability to monitor progress during the sessions and your excellent software, proved a winner. KAZ was easy to operate and staff can now use it to build their skills in the future." "I have used KAZ in an after school typing club for junior children. It was very successful, one Y5 girl used KAZ at home and at school for several weeks and now has a typing speed of 56wpm! Very impressive!" "KAZ is one of the most appealing and user friendly software keyboarding packages that I have used." "Other typing tutors are cumbersome compared with KAZ. If you want to learn to touch type without hours of tedious training that could put you off for life then this has to be the program for you." "The children are eager to come to the classes and they are all finding the software easy to use." "It is a very good touch typing program that I have recommended to many people, even purchasing on behalf of parents. Children and adults are able to very quickly learn the keys and have success typing. KAZ is a great program!" "Thank you for providing a very simple-to-use, child friendly course. It has been a great help to the pupils I have taught so far and I will now roll the programme out to the entire school." "User found the software easy to use, reliable and effective. A large majority of students would recommend the software to family, friends and other students, and thought the software should be provided for students in future years." "Ufi have delivered KAZ through the learndirect network since 2001. In this time the product has been popular, and very well received by learners. 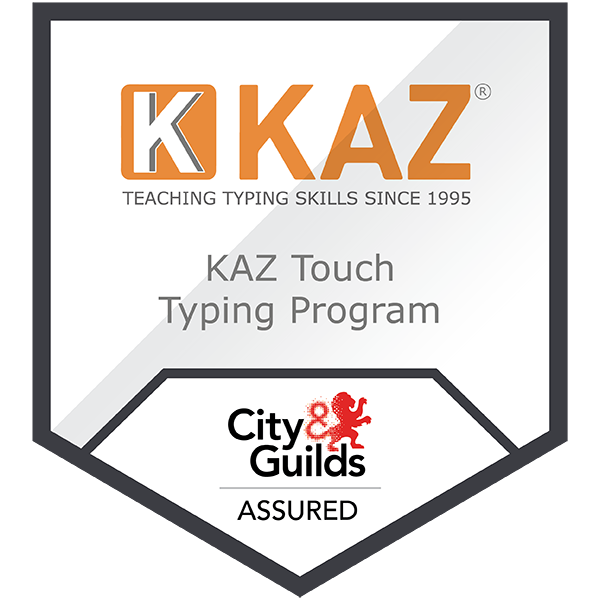 KAZ is a good introduction to touch typing and has been delivered by learndirect both as a standalone product, and as a superb accompaniment to Word Processing CBT." "KAZ's clever phrase-based approach really does work." "I certainly enjoyed the experience. Lessons and atmosphere were low-key, clear and thorough and the threading and building on what you have learned is awesome. I think it's ingenious how you blend instruction for adults and kids into one package." 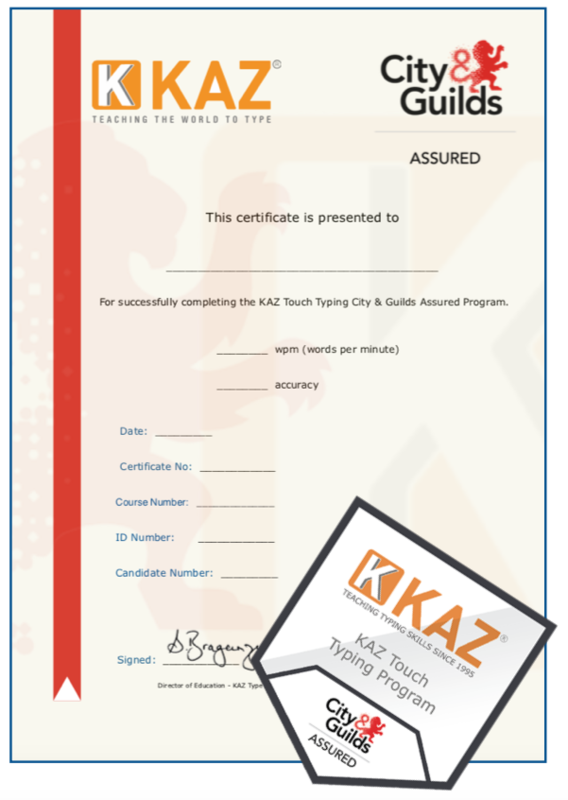 "If you can't already touch-type, start learning with KAZ." "As good as it claims to be. It is everything it claims to be, it is easy to understand, colourful. I found it very easy not to look at the keys whilst I was typing." "I bought a version of this about 5 years ago and successfully learned to touch type. I am going to buy the latest version now as my kids need to learn. Highly recommended for its simplicity." "It just works, which is great and how all software should be, uncomplicated simple to install and use, great..."
"We have been KAZ users for 5 years. KAZ Online far exceeds our wildest expectations. Our students and parents love it." "Thanks for your prompt reply. I really appreciate the time and interest that you have shown. It says a great deal about your company that you take the time to be so helpful. This is not true of many organisations so you are to be congratulated." "Thank you so much for your reply. I followed your instructions and everything is fine. Once again thank you for your support and efficiency. I certainly will be recommending this software to colleages." Interactive multimedia, with text and audio instruction and provision of 'speaking keys' option, covering the A-Z keys. One year free technical and user support. Comprehensive and easy to use back office - ability to import the school database in minutes and monitor student progress.